In honor of Dominique Georges Pire, a Belgian cleric and Noble Prize winner for helping refugees in post-world war II Europe, who was born on this day in 1910. 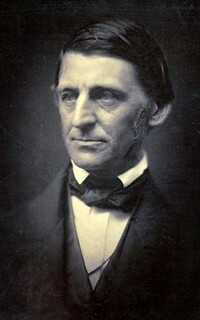 In honor of Ralph Waldo Emerson, an American essayist, lecturer, and poet, who was born on this day in 1803. When I accompany my wife on a clothes shopping trip, I have an abundance of time. 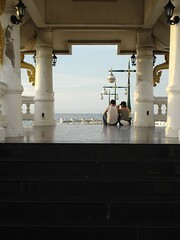 I seek out the bench or chair, tucked away in some corner to make husbands feel less self-conscious of their surroundings. 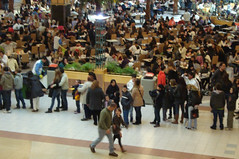 While my wife beats every sales rack for the elusive prey of reasonably fitting jeans, I watch people. You can learn a lot about a person by watching how they treat people. I have seen a man marching down the middle of the aisle, barking orders over his shoulder to the mother of his children and their progeny. I see a loud, manly, man with little regard for the impact of words. I have seen a fashionista ricocheting down the aisle, enamored by the glamorous contents of sales racks with passing concern for the burdened man-servant kept in waiting. I see a group of couples meandering along. I hear a boy make a joke. I see the payoff of laughs that he receives and I can see the impact on his girlfriend, who has to pay the bill. I watch a family with every hair in place and every shirt tucked in. There are obvious exacting standards at work within the family. I wonder if those standards are held in place by one of the spouses demanding and unrelenting obsessive compulsions. I watch a pack of young men ogle someone’s daughter with the same demeaning assessment as they make when purchasing a steak. I watch young women freely displaying their produce in the proud manner of a farmer. I cringe at what I hear. The grate on my nerves comes from both what is spoken but also how words are expressed. The honoring word is a rarity. The respectful phrase seems endangered. We should not be surprised by the difficulty that we have in our relationships when you consider how elusive the gentle and quite spirit seems to be. Peter encourages our marriages to be characterized by honor and respect. Men and women have different roles but honor for one another should be evident as we conduct our lives together. Consider all of the problems that arise when we fail to honor each other. I will inevitably hurt my wife if I am rude to her. I will inevitably alienate my wife if I am indifferent to her. I will inevitably crush my wife’s feelings if I am forceful to her. I will inevitably devalue my wife if I refuse to listen to her. When I respect and honor my wife as a fellow heir of Christ, it makes it easier for her to be respectful and honoring of me. Her subsequent response to me makes it easier to honor her more. The cycle of honor can become a wonderful catalyst to oneness between a man and woman. However, this is not just an encouragement for women. Men are encouraged, multiple times, to have the same spirit; to be gentle and to be slow to speak. The admonition to have a gentle and quiet spirit is for both men and women in our specific God ordained roles. We are encouraged to have the same spirit because it is the fruit of the Spirit of God. How much our relationships would improve if we were more gentle with one another? How many conflicts between men and women would be averted if more self-control was employed? This is why you can learn a lot about a person by watching how they treat other people. The fruit of our spirit is on display in how we treat other people, particularly our spouse. No one can hide their spirit within the closeness of marriage. We have problems in our marriages because we don’t have enough respect and honor. We don’t respect and honor one another because one or both spouses lacks a gentle and quiet spirit. We don’t have gentle and quite spirits because we lack the fruit of the Spirit. We lack the fruit of the Spirit because we are not walking in the Spirit. For those who are single, do not be blinded by your desire for a relationship. A prospective spouse should be evaluated on the fruit of the Spirit in his life. You should know where he walks before you join him. Is he walking in the Spirit or does he spend more time walking in the world? There will come a time when the fog of romance burns away. If you want to be in a relationship that is built on honor and respect, then it has to start on the sure foundation of Christ. Do not settle for second best. The same is true for marriage. Marriage is a beautiful dance of individuals, maturing through time. There are times when partners can get out of rhythm. The beauty of a marriage between fellow heirs of Christ is that there is a unity of Spirit that can be relied upon. It is the fruit of the Spirit that sets the beat of our hearts. When our steps are in concert with the Spirit, the catalyst of honor and respect will start to spring forth in glory to our Father as a couple lives as servants of God. The honor and respect in our relationships tells us a lot about our walks with God. PRAYER: Lord, thank you for my wife. Thank you for her gentle and quiet spirit. Thank you all the work that you are doing in her life that has produced such wonderful fruit from your Spirit. Father, continue to do that work. Continue to do that work in me. Lord, give me a gentle spirit. Give me a quiet spirit. Teach me how to honor my wife like I should. Help me honor her in my thoughts, actions, and words. May our marriage bring glory to you as we strive as a couple to serve you. I pray this in the precious name of your Son, Jesus Christ. Amen. Christians have been called all of these words and many more. We have been mocked in movies, television, and political speeches. We have been cast as being repressed, oppressed and regressed. Popular culture frequently paints the landscape of Christianity with rigid lines, stark geometry, and drab colors. I hate the representation of my faith that is commonly presented in the current culture. I feel so misunderstood when my hope becomes lumped in with religions of works. I cringe when I see grains of truth twisted in the legalism of a fear of the world that does not demonstrate the freedom that I know in Christ. I understand that secular society and the media are not friends of Christ. What is our basis to expect them to be fair in their presentation of Christianity? Why would I expect them to give a fair and balanced presentation of what I believe? Much of what is shown in the realms of entertainment and journalism comes from the ignorance of people who have not had their eyes opened to the reality of the God of the Bible. We can shout until we are blue in the face about the injustice of our image. We can fight a media campaign to spin our message into the world. I think that all those attempts will fail. Peter tells us how to fight the good fight. We will put all those naysayers to silence by doing one thing – doing good. So much of our Christian lives are spent saying “no”. Many are saying “no” because they are afraid that there is a demon under every bush and if they don’t keep a prescribed set of rules they might be thrown with the chaff into hell. That is not living in freedom. That is not doing good by saying “yes”. We are to live as people who are free. A free persons does not say “no” to enticements from a fear of the world. A free person’s abstinence from the things of the world is a “yes” to living as a servant of God. Therefore, our lives should be awash in doing what all people will recognize as good from a motivation of freedom. Our good works are to come from a joyful response of getting to serve God. Our good works are a response of love. That is how the ignorant portrayal of the followers of Christ will be silenced in this culture. When our friends and neighbors fail to recognize what is presented by Hollywood as the Christians that they know, then they will reject the culture’s portrayal of a twisted and false faith. The problem is that even I see truth presented in many of these derogatory manifestations of my faith. Honoring everyone: Those offensive signs condemning the lost would be gone. The rude and insensitive debates would vanish. Honor everyone does not mean that we have to agree with everyone but it does mean that we follow the “golden rule” and treat others as we would like to be treated. Loving the Brotherhood: The incessant bickering amongst the followers of Christ would be replaced by loving debate and respectful disagreement. We would not be in the courtrooms of the world having our disputes settled by common law rather than the Word of God. I don’t have the answers to how we work through theological differences that do really matter but I know that we can do it so much better than it has been done. We should be cognizant of the reality that a lost world is watching how we treat each other. Why would they want to be part of a faith that espouses love but whose members can’t even love each other? Fearing God: The high profile scandals of the tabloids would not include the children of God. Christians do a lot of really stupid acts that earn the title of hypocrite and diminish the power that we profess. I know that we are all on the road of sanctification. We all stumble. However, the colossal moral and public failures of Christians should be much rarer than they actually are. If we all lived with more of a fear of displeasing our Father in heaven rather than pleasing ourselves, we will be a better representation of what we claim to believe. Honor the emperor: The vilification of political opponents would not be cast in the mantle of the Church. There are few topics more divisive than religion and politics. There is nothing more divisive that the combination of religion and politics. I realize that we Christians should speak out for many of the moral affronts and persecution that governments do. The issue is how we do it. President Obama should feel honored by the religious right even though he knows that they disagree with his direction. Our Facebook pages and discussions should not be strewn with disrespectful and offensive caricatures of our leaders. Our obedience to Christ should extend through all aspects of our lives, even honoring and praying for leaders we don’t agree with. Just imagine if these characteristics were the common experience of the world for a person who professed Christ. It sure seems like the ignorance of false representations would be silenced. PRAYER: Lord, forgive us for not living as a servants of God like we should. Father, do your work in me; fill my life with good works that come for a heart that just wants to serve You. Help me to be honoring to everyone. Help me love those brothers and sisters in Christ with whom I have disagreements. Help me to fear you as I should. Help me to honor and pray for all my leaders, especially the ones I don’t like. Lord, be with your church. May I be a part of a larger working of your Spirit that silences the ignorance of foolish people. May the good works of a people set free in Christ be a beacon to a lost world. I pray this in the precious name of your Son, Jesus Christ. Amen.